I got this card with the offer of a companion pass and 30,000 points when you spend 4k in 3 months. I did that and IMMEDIATELY received both perks. I've also traveled to Mexico and Honduras with this card and had 0 issues using it. So far I'm happy! Look at all the negative reviews.. People angry that they didn't pay their bill and blown away that there were consequences..? The credit card is not for investing in any kinds of stock, your hustling with the banks money and putting them at risk by doing so. Go figure! Don't be fooled. You may see that there is a promotion offering 40,000 or 50,000 points for signing up and spending 1 or 2k in the first three months. Instead, you will receive 10,000 points. If you try to message them or call them to recieve the missing points, they will tell you that at the time you signed up they were only offering a 10,000 point bonus, EVEN THOUGH IT CLEARLY STATED 50,000 points! Your complaints will fall on deaf ears, and your concerns brushed aside. This is a scheme to make it seem like a much better deal than it actually is. 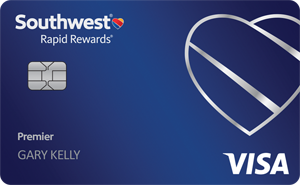 I enjoyed other aspects of owning this card, but I just can't recommend this to anyone knowing how dishonest Southwest and Chase are being with these promo offers. you have to spend 25000 in a year to get the 50000 thats what there web site says after you spend a 1000$ in the first month you gotta pay off that 1000 dollars before the 3rd month. I applied for this card in Febraury while booking a trip. I read here that they wouldn't honor offers so I screenshot the offer of 50k points afer $2k spent. Well they wouldn't honor the offer and told me I signed up for an offer of 10k points and a $200 credit. I have NEVER seen that offer anywhere. They are giving me trouble about clearing this up! I like the card but screen shot everything! The T&C the offer...everything! The 50k or 60k is if you spend 25k in a year other wise you get 40k if you spend 1000k in 3 months. Love SWA and love this card ! I use it to pay all my monthly bills and big expenses and get +1,000 points every month. The initial offer is great and you also get 6,000 points every year so pretty much a no brainer if you are a frequent traveller. Excited to have this card! I love the bonus points when you spend the $1,000 in the first three months. It is a great deal that will let me book at least 3 flights from those points alone. The application process was very easy, and I was approved with a credit limit similar to my other highest cards. I called Chase to see if I could go ahead and book a flight before my card arrives, but for security purposes they could not disclose the number to me. However, they did offer to expedite the shipping on my card so I can book my flights sooner than if it had arrived with standard shipping. Their customer service was nothing but kind! Also, I like that I can schedule payments when my transactions are still pending, instead of waiting until they are fully reflected on the balance. You need to scrutinize the offer.. They advertised to us as 200 off your initial ticket price and then 50000 bonus miles after you spend 2000 in 3 months. We met this requirement and then were told that was not our offer... The offer was 200 and 10000 bonus miles after spending 500 and that supposedly it was an either or option and I chose the 10000 miles option. There was never an option to select one or the other and they refused to work with us to correct the situation.